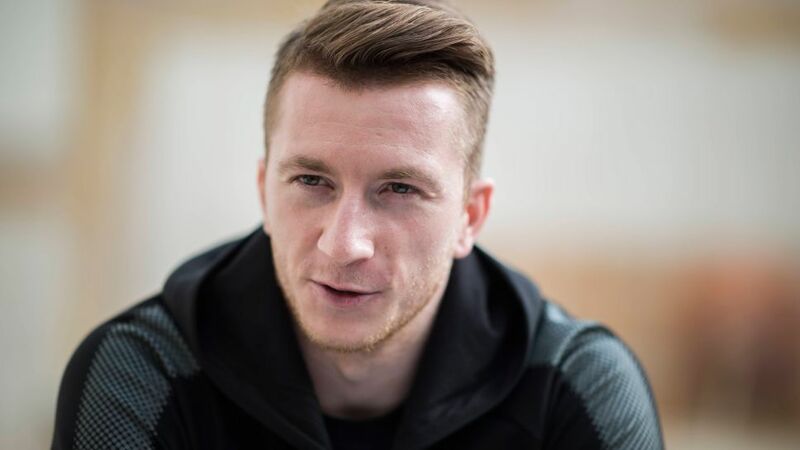 Borussia Dortmund attacker Marco Reus says he is "optimistic" about his recovery from long-term injury and although regaining full fitness is his first priority, earning a place in Germany's 2018 FIFA World Cup squad is also firmly in his plans. Speaking to the media at the club's winter training camp in southern Spain, the 28-year-old also discussed how it feels being on the sidelines, his influence on the Dortmund squad and what he makes of new boss Peter Stöger. "So far everything's gone to plan. I trained really well in Dubai (while on holiday over the winter break) and had some really intense sessions. I've continued that here and so being in Marbella has been like a second training camp for me. I'm very satisfied and I'm happy that I was able to take part in the sections I did. I hope over the next few days and weeks that I can intensify that even more with a view to making a full return to training." "It was interesting to observe from the outside. Obviously I was with the team all the time but it's a bit different when you know you're definitely going to be absent for the whole first half of the season. It gives you a different perspective of things. Certainly there were a couple of things that weren't nice but now we're ready to make amends and to do things better. But that's not to say everything was bad." "We'll see. I haven't set myself a date by which I want to be back. It's hard to say, given the kind of injury it was, because there are still several steps I still need to take. But I'm positive and I think that in the next few weeks things will progress. Then we'll just have to wait and see." "As a footballer there's nothing worse than being injured, especially for such a long period. I'm extremely impatient. But things like this are part of the game and I'm an optimist, so I'm always looking ahead. That's what I'm doing in this situation too. I'm happy that I'm able to participate in some sections of training." "I'm in contact with Joachim Löw, and that's very important to me. But for now my first priority is to get back into full training with the team. After that the aim is to starting playing again and then to find my rhythm. After being out for such a long time with an injury like this it's not easy to come back and play well, but anyone who knows me knows that I have the potential to do that and I've got the right mentality too. I'm optimistic. If everything goes to plan and I get time out on the pitch in the coming weeks and if I'm fit then obviously I want to play for Germany too." "He's very open and very ambitious. He's very clear in his instructions, which is really important. Training's a lot of fun under him, especially for me, having been away for so long. Even if it's tough I still enjoy it. He's made a really good impression and you can tell that he and his staff have got big plans. Obviously we want to support him as best we can so that we're successful together." "It's mainly doing little things, like talking to some players who didn't play much in the first half of the season and are maybe a bit unhappy. In those cases I do try to help and to be there for the team so that we can be even more united out on the pitch, so that everyone - both the players and the coaching staff - can get to know each other a bit better. There are some things you can do but it takes a bit of time for changes to take effect."